Glutamine (also called l-Glutamine) actually is one of the amino acids in our body. It is very important for immune and muscular systems. Glutamine plays a very big role in protein metabolism, which is important for bodybuilders. So a lot supplement companies are offering a big amount of different glutamine pills and powders for fitness enthusiasts and bodybuilders. To see the effect of using glutamine, companies recommend to use 5-10 grams of it. But what are the best effects of using glutamine? One of the main benefits of using glutamine is that it helps to prevent catabolism. When you put your body under a physical stress, it uses glutamine that is in your muscle. 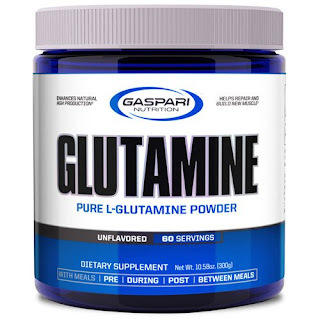 By supplementing your body with extra glutamine, you help your body to use this extra glutamine rather than glutamine that is stored in your muscles. This prevents the body from breaking down the muscles. Also glutamine is very important for your immune system. It doesn’t sound so ‘’cool’’ as muscle building, but it is as much and even more important. Just imagine yourself sick in the gym… Not so good, huh? Just getting sick means that your progress of training will go down and you will lose days of productive training. So, looking on these benefits above, even non-athletes may consider that glutamine can be good supplement for them (healthy intestinal tract for example). But if you are an athlete, bodybuilder or just a fitness fan, glutamine is one of those MUST HAVE supplements!